Blogging is no new idea, and in fact everyone can own a blog because it is completely free of charge thanks to Google. Yes, its true, you can make money from your blog if you know the right ways to go about it. Now, before I continue, I would like to point out that there is no short cut to making money online fast and easy, you need to put effort into it and learn the right blogging strategies. A blogger I met only once said “Blog Money is Blood Money” Of Course he doesn’t mean it literally. What he means is you can make thousands of dollar online as a blogger once you get your blog on auto pilot. This is a system in which you sell other people’s product and receive commission on each sale. Lets say your blog is about Dog training tips and you have really got your visitors coming back, you can take your blog a step further by selling affiliate products relating to what you do. This is quite easy as you can put it in the bar and footer area of your blog. Another way to get more sales is send sales emails to your mailing list if you have any. You can get as high as 50% to 75% commission on sales through your affiliate link. 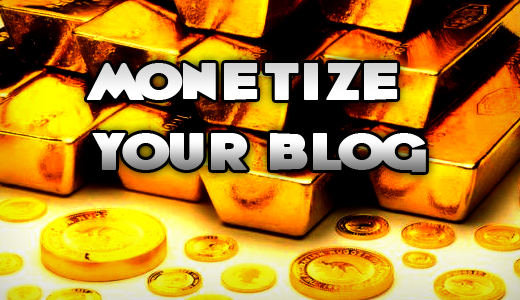 Services like ClickBank, CJ.com, eJunkie.com and even private networks like Amazon gives you a great opportunity to monetize your website using affiliate marketing before you start getting deals from private advertisers. I recommend Clickbank because it usually has higher commission compared to other networks. If you don’t already have a Clickbank account, got Clickbank.com to get started. You can also sell links on text-link-ads.com which makes the selling of link automatic using their plugin which you would put on your blog. So you don’t have to border about checking it often. All you need is a little promotion. It is advisable you take only links that are related to your blog niche but if the price is right you can take links that are not related. Remember: The goal is to set your blog on passive income mode within the shortest period of time possible. Since its monthly income, you can get more people to subscribe by offering a discount if they pay for three months in advance or higher. Register for Text Link Ads as soon as your domain is in the 200k category on Alexa.com or you have a page rank of PR 3 or higher. The popularity of the small 125×25 advert banner has increased tremendously in the past two years. They are sometimes referred to as blog sponsor’s or recommendations. There are other forms of advertisement size like 250×250 and even sky scrappers. You can sell any size of advertisement banner you like. Since its on monthly renewal, you can score more sales by offering a discount if they pay in advance. These are the way you can use to monetize your blog apart from Google Adsense. If you have good page rank and traffic don’t just abandon your blog the moment your adsense account gets disabled for any reason. All you need to do is create alternative methods of income so that if Adsense goes off, you can fall of the earning coming from other sources. Leave a comment below and you would hear from us. Also sign up for our mailing list in the side bar and never miss another update again. Thanks for the review. I haven’t heard some of the names mentioned, I’ll be sure to check them out. I’ve found affiliate marketing to be the best form of monetizing the blog, however I only use products/services which (might) contribute to the blog. I agree that text link ads and sponsored reviews can be quite productive in terms of earnings as well, I am VERY careful with this (especially with automatic code) though. In addition to some of the mentioned platforms, I can also add teliad to the mix. It’s one of the older platforms around and gives the opporturnity to sell both text links as well as sponsored/paid reviews. Affiliate Marketing and Paid Reviews are the two best ways here for generating quick income online through blog. Although you have described all the points very beautifully and smartly.